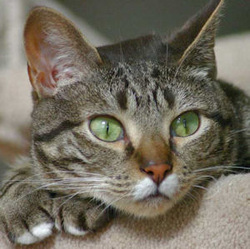 Duncan, a striking grey-brown tabby, is aptly named. One of his favorite past times is to "dunk" his toys into his water bowl and then fish them out. Actually he likes dropping toys into any kind of "receptacle". He'll drop a toy into a brown paper bag, a box, a basket or into the gap between the headboard and the mattress and then dive after it. His markings are almost identical to his brother's, the only difference being the color. He doesn't meow a lot but talks to you in these little trills, sort of a little "prrrpt!". He loves to pounce on his brother through a sheer separating the bedroom from the dressing area. Duncan (and Galen, too) exhibits a superstitious behavior when he uses the litter box. This is a behavior they've had since I got them and I suspect they picked it up from their mother. Whenever they poop, they'll hold one front paw up. Sort of the kitty equivalent of sticking a pinkie out when drinking a cup of tea. Duncan is also fond of a particular basket I have which has a sheepskin lining. I had purchased it for a cat, Vash, I used to have who passed away a few months before I got the boys. She loved to curl up there on a cold winter night while I'd be watching TV. Duncan, however, won't sleep in the basket. He will sit in it and knead the sheepskin, closing his eyes and purring. For reasons only the cats understand, he, alone uses this basket and only for this one behavior. I have other wicker baskets around the house. There was one I was going to throw away after the handle broke off, but the boys love jumping in it and batting at each other from inside it. While Duncan isn't as demanding for affection as Galen, he has his own time and place. Usually when I'm sitting sitting at the computer. He'll place one paw on the side of the chair and wave his other paw at me to get my attention. He'll also come by my recliner in the evening seeking a pet and a rub of the head. Sometimes he'll even stretch out on my legs while I sit back watching TV. Whenever he wants my attention, he'll come up from behind and tap me with his paw. When I have foster kittens, Duncan is the only one check them out. He likes to play footsie with them under the door, provided there's no mamma kitty on the other side expressing her displeasure. The other two just hiss at the sight of any new cat or kitten. They've even been known to hiss at me the first time they smell a new foster kitten on me.